With the small artillery force, the equipment was not really good, but the Lao Army overcame by mechanizing one of the most powerful firepower in the service, the D30. A number of recently released images have surprised Asian Military Forums when the Lao People's Army successfully mechanized the 122mm D30 howitzer model developed by the former Soviet Union. It is worth mentioning that there are only about 10 cannons of this type in Laos artillery. 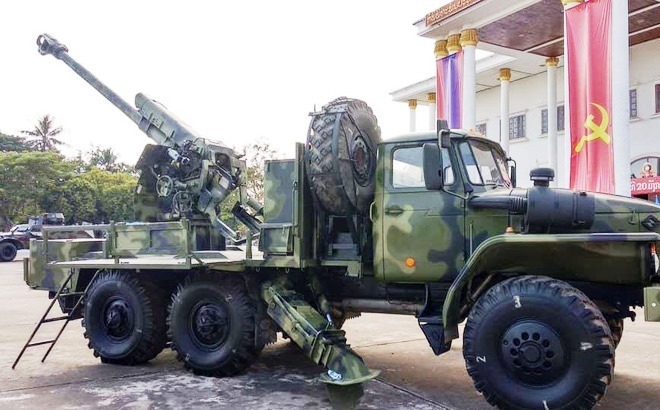 In such a modest amount, it seems that the Lao Army decided to mechanize the entire number of D30 artillery they had on the active Ural-4320 3-wheel military transport chassis (6x6), Similar to what Vietnam has been doing with the 105mm M101 model of American artillery. 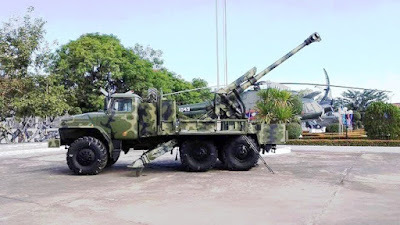 It is possible that Laos has referred to the mechanized and self-propelled artillery M101 solution that Vietnam has implemented to upgrade the D30 by placing it behind the Ural-4320 body on a fixed welding platform on the chassis and 3 more. Hydraulic legs, on both sides and middle of the rear. It is also worth mentioning that in the Lao Army staff, another model of self-propelled self-propelled gun could be used as a model for the country to mechanize the D30 howitzer, CS/SH-1 made by China. . The way Laos improved the Ural 4320 and combined with the D30 cannon was quite similar to the CS/SH-1 design, especially in the more hydraulic position in the center of the body, more notably the Chinese 122mm model. for CS/SH-1 is the localized variant of the D30 cannon built by the country itself, the Type 86 or Type 96. Thanks to mechanization and optimization of operation, the Lao D30 artillery shell after being upgraded can be pulled from 8 to 4 people, similar to CS/SH-1 and carry the number of bullets from 20-30. . Meanwhile the range of the D30 cannon will be almost constant, reaching 15km with normal bullets and 22km with bullets that increase range and maintain the average rate of fire of the D30 from 5-6 transmitter/minute or maximum 12 plays/minute. The total combat weight of this self-propelled artillery model after the upgrade can fall to around 12-13 tons, including the number of spare ammunition to carry, quite suitable for the ability to maneuver on Ural-4320 and The conditions of the field roads are as in Laos. With the technical parameters - tactics of the D30 after being mechanized, the combat capability of this model will be significantly improved with faster and more dynamic deployment and recovery time on the field and just from 4-5 gunners to operate. Basically, the combination of wheeled truck with ground cannon is considered a good plan for the military of countries with limited defense potentials to modernize or improve the fighting capacity of the force. Low-cost artillery, while being able to maximize the mobility of the weapons on the battlefield. It can be seen that the solution Laos chooses to upgrade the D30 cannon is perfectly reasonable. In terms of their current level of defense industry, this can be considered a huge step forward. 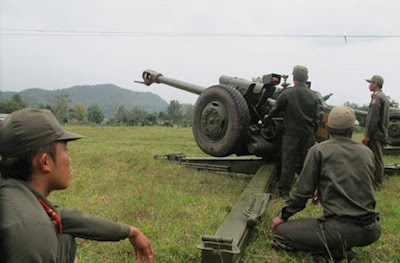 However, it is not clear at what stage the mechanized program of Laos's D30 122mm cannon has reached, and whether it is supported by foreign experts. Malaysia’s land, naval and air defence assets are ranked the lowest among all Southeast Asian countries, says Defence Minister Mohamad Sabu. “Vietnam is far ahead, Indonesia is on top while Malaysia is the lowest. Globalfirepower, a website which assesses the military strengths of countries, in its ‘2018 Military Strength Ranking’ ranked Malaysia in fifth out of nine countries in Southeast Asia, ahead of Philippines, Singapore, Cambodia and Laos. semua Negara ASEAN belanja minimal upgrade...ada satu negara yang katanya Grade A belanja juga cuma halimunan...belanja yang tak nampak...😁😁😁....siapakah negara itu??? Maling kirim nota protes & bikin berita HOAX. Tapi teriak kenceng di media ngaku sbg korban penculikan. Indons army are the most weakest and idiot army..do a side income job by kidnaping harmless people to get some money and also do a pirate job but caught by malaysian police later..this news already know by all asian country or even all around world. FINALLY, @unknown, "We agree that the Malons Defence Ministry has to defend the country, but with what lah? You had left behind a legacy of low morale, useless jet fighters, submarines that cannot dive, missile ships with no missiles. Actually, how many of our armaments are white elephants? Have these ever been serviced or been left aside to rot? A good worker needs tools, to work effectively. This is not a kamikaze situation. Until and unless we strengthen our defence, it is better to find a peaceful solution. If you realise the kind of budget Singapore puts aside each year for its defence, you will put up the white flag". Malons army are the most weakest and idiot army in the world, do a side income job by kidnapping harmless people to get some money and also do a pirate jod like SOMALIANS but caught by Indonesian police later...this news already know by all asian country or even all around the world !!! Indons army can't even defeat 10 papuan people due to lack of moral and coward. Indons army coward because ran with taxi in lebanon plus can't defeat papuan people that just 10 in number. Malon army laskar pondan are the most weakest and idiot army..do a side income job by kidnaping harmless people to get some money and also do a pirate job but caught by indonesian police later..this news already know by all asian country or even all around world. 4.sebenarnya pribumi malaisia itu nggak kaya beruk, tapi pribumi malaisia itu aslinya beruk yang menyerupai manusia,jadi otaknya memang asli maxsimal bebal. Indons Army is the weakest and Idiots in Asean. In fact their 10,000 Idiot Soldier cant even intimidate 10 Papuan Soldier. Oh kata ini kata si Malon bencong peyot tak ada ilmu, bagai katak dalam tempurung. Lao Army are not Interested in buying Indons made. For them, those Indons made are garbage and poor quality. Oh kata ini kata si bencong peyot tak ada ilmu, bagai katak dalam tempurung. Laos can donate their howitzer to poor Indon!